You guys, I have a problem. My name is Kelly and I have a crust addiction. Seriously, please look at these photos that are supposed to (and do!) 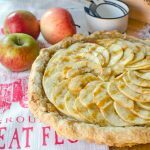 represent the most delicious apple tart ever and see how I unconsciously tried to turn my tarts into pie by totally overdoing it on the crust! I just cannot get enough! Thanks to this, these beautiful little buggers now look a bit more like they’ve been made by a fifth grader. If you look closely, you’ll even see a massive hunk of one tart crust completely AWOL. It was a casualty of war and fell off during the baking process. Of course I gobbled it up immediately, resulting in a huge sore burned spot on my tongue. This is really is an issue! To satisfy my crust addiction, I actually baked two separate crusts – one that is my usual delicious flour-y traditional tart dough recipe made with Bob’s Red Mill Organic Unbleached All Purpose White Flour and in the other I subbed in Bob’s Red Mill Gluten Free 1-to-1 Baking Flour. Because I have a couple of gluten free friends, a girl’s gotta have some good gluten free baking recipes up her sleeve! I made a gluten free sweet potato galette a few weeks ago and it was wonderful, but the recipe seriously had five different types of flours. For most casual bakers, that’s a huge expense and a hurdle to making a gluten free recipe. I’ve used and trusted Bob’s Red Mill flours for ages so I knew if anyone could cut down those five flours into one easy gluten free flour, it was Bob’s. Both apple tarts were a-mazing. The addition of salted caramel sauce really took them up a notch and they were quickly devoured by our household. I was very impressed with how well the gluten free flour performed. Although it definitely wasn’t quite the same, it was super easy to use (just swap it out for the all-purpose flour in your baking recipes) and only involved purchasing one product. The crust was flaky and delicious, but slightly chewier than its gluten counterpart. I thought it wasn’t quite as buttery as the original, but Pat actually picked the gluten free tart as his favorite in a blind taste testing! I also thought that the gluten free tart held its shape better during the baking process, but that could be confounded by my overdoing of the crust size in both tarts. So, even though it’s different than regular flour, Bob’s Red Mill 1-1 gluten free baking flour is going to be my new go-to when those gluten free pals come to visit. And when Pat’s picking the crust, it’ll be what we’re eating in Chez Sweet as well. Maybe with a bit less crust next time. Maybe. Makes 1 ten inch tart. Whisk together the granulated sugar and the water in a small saucepan, and cook over medium-low heat until the sugar is just dissolved. Add the butter and bring to a slow boil. Continue cooking over medium heat until the mixture turns a deep golden brown, almost copper. Remove from the heat and immediately but slowly add the heavy cream – be careful, the mixture will bubble rapidly and steam. 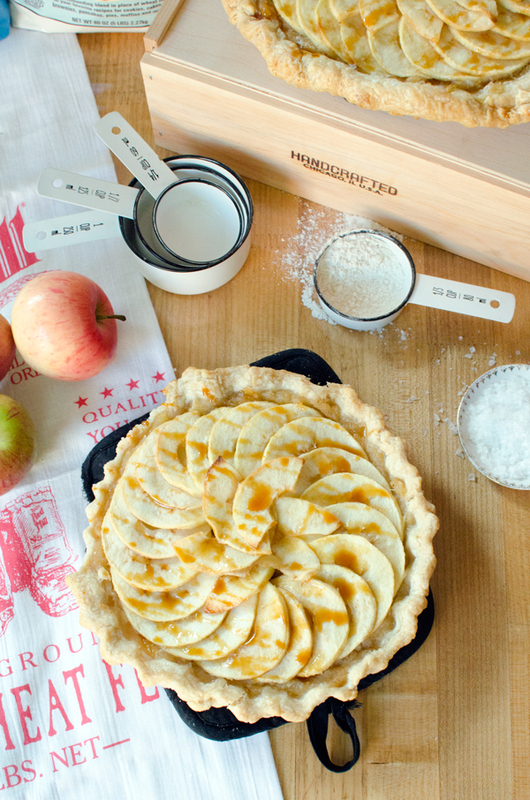 Whisk the final mixture together well and set aside to cool while you prepare the rest of the apple tart. Place flour and butter in the bowl of a food processor. Pulse briefly until mixture forms large crumbs. In a small bowl, stir together salt and cold water. Add the salt water mixture to the base of the food processor and continue pulsing until the dough has just formed but is not smooth. This step can also be done manually with a pastry cutter or two knives. Turn dough out onto a floured work surface and form into a disk about 1 inch thick. Wrap with plastic wrap and chill at least 2 hours or up to overnight. Cut 4-5 apples into large chunks. Heat apples, lemon juice, sugar and water in a medium saucepan on low heat, covered, for about 20-30 minutes. Break apart with a wooden spoon or potato masher leaving some chunks. 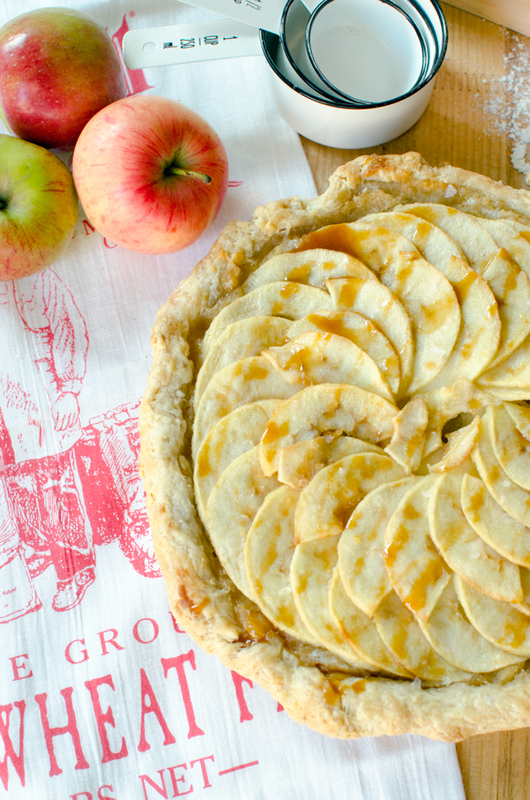 Mix salted caramel into mashed apples and set aside while you roll out your crust and slice your apples. Slice remaining apples into thin circles to layer on top. Roll out chilled tart dough on a floured surface and place in your tart pan. 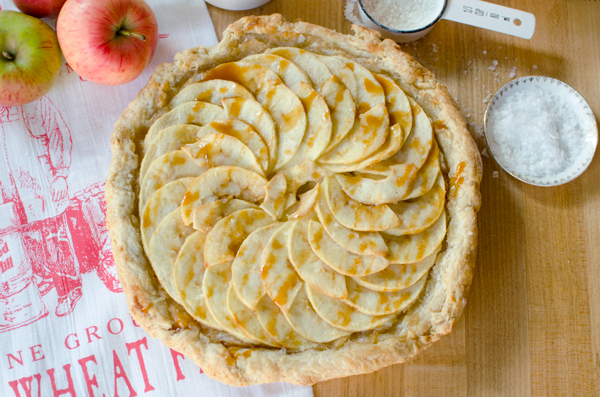 Fill the tart shell with mashed apples. Layer the sliced apples on top, starting with the outside. I found that for the inside ring and center I needed to cut my circles in half to get them to fit. This may have been because I sliced them slightly too thick. Be sure to be generous with the apples as they will shrink a bit while baking and have the potential to expose the mashed apples underneath. Brush the crust with heavy cream and the apples with melted butter. Bake at 425F for 10 minutes, then without opening the oven, decrease temperature to 350F for 50-60 minutes more. Apples should be soft and slightly brown and the crust should be golden. Drizzle with salted caramel sauce and sprinkle with sea salt to finish. Serve warm or at room temperature. Tips: I recommend doubling the salted caramel recipe so you can have more of this delicious nectar of the gods to eat on everything or just by the spoonful! Looks delicious! I’m the opposite to you, I never like too much pastry….although somehow I still manage to eat plenty of pie 😉 I love the combination of apple and caramel – yum! We’re the perfect pair then! You can come over and help me eat the filling any time! I’m all about the crust too! Now I’m singing “I’m all about that crust, ’bout that crust” to the tune of “all about that bass” in my head. 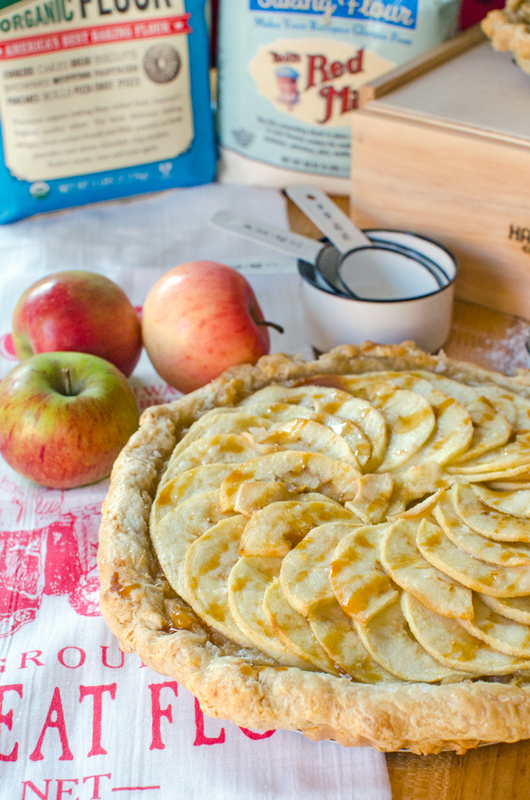 THANKS for that, Ashley;) Mmmmmmm – salted caramel apple tart sounds like something I’d happily eat right now. Ahahaha, so funny! now it’s stuck in my head too! Thanks a lot Sarah. Nice! I’ll keep you in mind next time I find myself in this sort of situation! I have become totally addicted to salted caramel and apple pie is a favourite in my house, so the gluten free variation is on my baking list 🙂 It’s lovely of you to experiment with gluten free options! Thanks! It’s fun to push my boundaries as a baker, especially because of these new gluten free friendships! 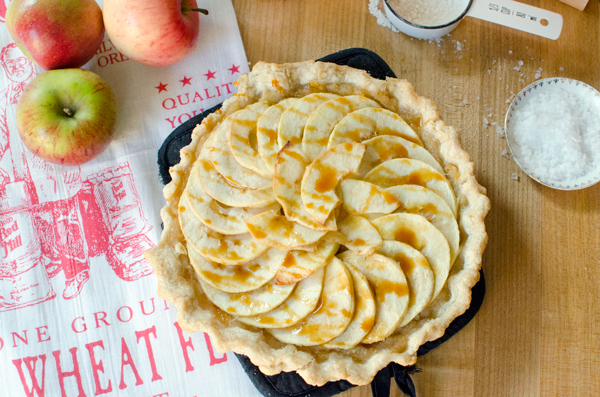 This apple pie looks delish! Perfect for Thanksgiving and way better than any store-bought pie I have ever seen! The gluten-free aspect is great for my family too since we are all trying to cut down on gluten without sacrificing our favorite foods. Thanks Sahily! I agree – there has to be a balance if you’re trying a new diet. Gluten free crust lets you keep around this old favorite! Hahaha, it totally was! Thanks Sarah! I’m a total crust kinda-girl too! This tart looks so amazing, and I definitely think it’s worth a burned tongue! 😉 Just drooling over that caramel drizzle! Pinned. Hahah, two Sarah’s with similar thoughts right in a row (see below)! It was definitely worth the tongue burn! Now you’ve done it! I’m addicted too!! This looks outrageously good! 🙂 You are welcome to join my support group! The crust is absolutely my favorite part!! Love how flaky this pie crust looks! Nice! Good to see I’m in good company! It was perfectly flaky! yummy! thanks for sharing! i really need to try this! You should! Let me know how it turns out! The crust is my favorite part too! It looks incredible and I am totally drooling over that salted caramel! I feel like this post has helped me find a bunch of kindred spirits! Hooray for crust! 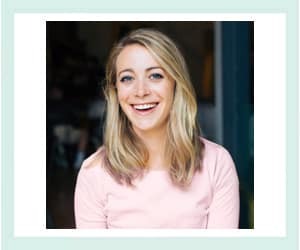 Girl, you are speaking my language! Hooray! Awesome! Great to hear I’m in good company!